Product fundraising is not popular with everyone. It does however have its place in many organisation's fundraising programmes. As a product to sell as part of a larger fundraising event - for instance promotional products or novelties such as Smencils. 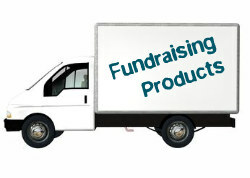 The success and popularity of selling particular fundraising items often comes down to how they are sold. If you have a good cause and a good product, fundraising this way can be fun and straightforward. Some companies will require you to buy products up front and offer you wholesale discounts to do so. You make your money when you sell on for your good cause. Companies will often offer much better prices the more you order. This is particularly true for spirit products branded with your organisation's logo, where a lot of the cost is in the printing set up. Beware however ordering too much stock which may be difficult to sell. There are plenty of companies out there trying to sell you their wares. There is one however that we believe is head and shoulders above the rest. Good range, simple to deal with, friendly but totally efficient. 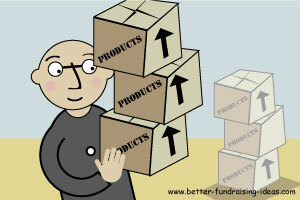 Most of the fundraising items below are those you buy from fundraising companies. Another option of course is to make or source your own. For instance a charity we know does a brisk trade in lucky horseshoes. They have struck a deal for old shoes from the local farrier, clean them up and sell them at every fundraising event they can. Some companies are starting to source and stock far more eco-friendly products and also those that ensure a fair price being paid to the producer. We can all encourage this process by using those companies where possible and putting pressure on the others. Simply asking the question flags it as an issue for those who wholesale fundraising products.